Phillips Oduoza, UBA GMD/CEO officially became the first person to carry out a MoneyGram outbound money transfer service from Nigeria, when on Monday, October 13, 2014 he sent N10,000 to the MD/CEO UBA Ghana through the MoneyGram outbound money transfer service. 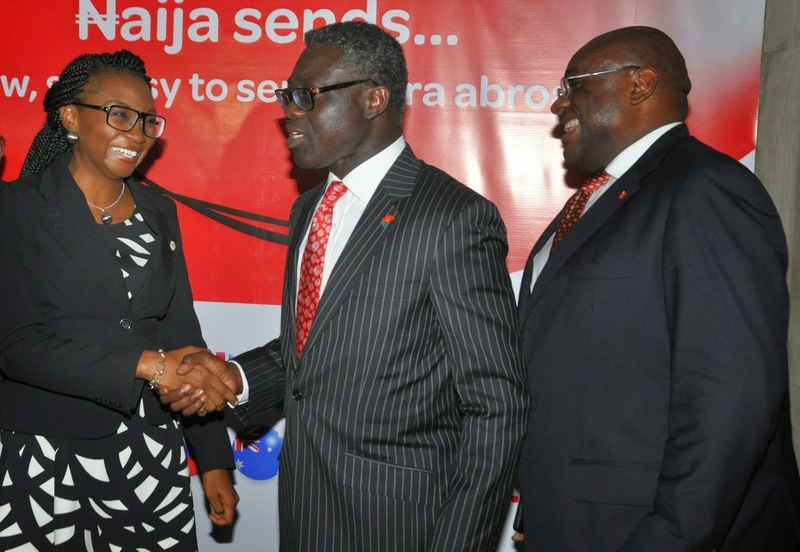 Regional Manager, Anglophone West Africa, MoneyGram, Mrs. Kemi Okusanya; GMD/CEO, UBA Plc, Mr. Phillips Oduoza; and Executive Director, Treasury and International Banking, UBA Plc, Mr. Femi Olaloku during the launch of Nigeria’s first outbound money transfer service by UBA and MoneyGram, held at UBA House in Marina, Lagos. The money, sent in Naira, was received by the Managing Director of UBA Ghana in Cedis in real time. 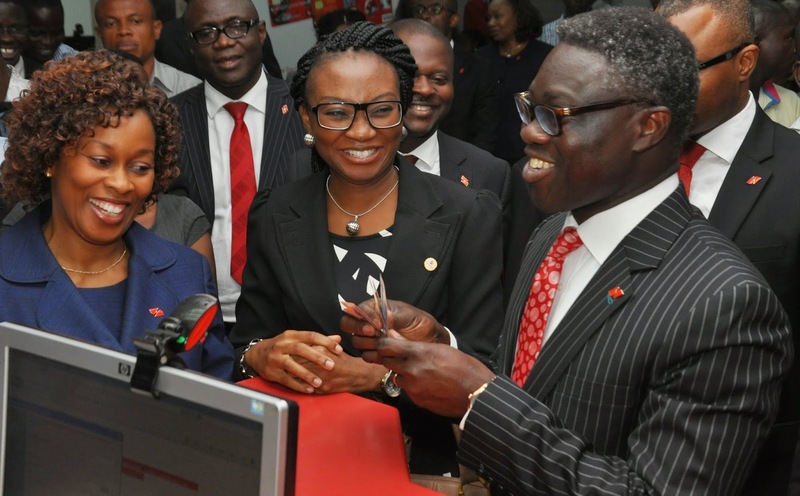 It was an occasion filled with significance as it marked the first time UBA and MoneyGram were able to provide the outbound money transfer services in Nigeria, despite being in the country in the last 15 years. The last 15 years has been a period in which money transfer services has become a huge business as people migrate from one country to another. Nigerians are known to a big part of the global migrant community. Following the path of international migration, remittance flows to developing countries have more than quadrupled since 2000, according to the World Bank. GMD/CEO UBA Plc, Phillips Oduoza (2nd right) initiating Nigeria’s first outbound money transfer service through MoneyGram in Lagos. With him are (left to Right) Div. Head Retail Products, UBA, Olumide Osunyomi, Regional Manager, Anglophone West Africa, MoneyGram, Kemi Okusanya and Deputy CEO, UBA Africa Emeke Iweriebor at the launch ceremony the UBA/MoneyGram Outbound Transfer Service. “Migration and remittances offer a vital lifeline for millions of people and can play a major role in an economy's take-off. They enable people to partake in the global labor market and create resources that can be leveraged for development and growth,” said Kaushik Basu, the World Bank’s Chief Economist and Senior Vice President for Development Economics. Nigeria is known major destination for remittances accounting for $21 billion of remittances in 2012, one of the highest globally. Remittances to developing is estimated will grow by an annual average of 8.8 percent for the next three years and are forecast to reach $515 billion in 2015, according to the World Bank. Until the Monday launch of the MoneyGram outbound money transfer business, Nigeria had only played on one side of the market, receiving the billions sent from abroad. The newly launched MoneyGram outbound money transfer service allows Nigerians to send money abroad too through any UBA branch in Nigeria or Africa while the funds are received in dollar or the currency of the receiving country. With this service, Nigerians can now send money to countries like UK and USA from Nigeria. The Nigerian will send money in Naira, the person receiving in UK or USA; will receive it in pounds or dollars. GMD/CEO UBA Plc, Phillips Oduoza (2nd right) initiating Nigeria’s first outbound money transfer service through MoneyGram in Marina, Lagos. With him are (left to Right) Div. Head Retail Products, UBA, Olumide Osunyomi, Regional Manager, Anglophone West Africa, MoneyGram, Kemi Okusanya and Deputy CEO, UBA Africa Emeke Iweriebor at the launch ceremony the UBA/MoneyGram Outbound Transfer Service. 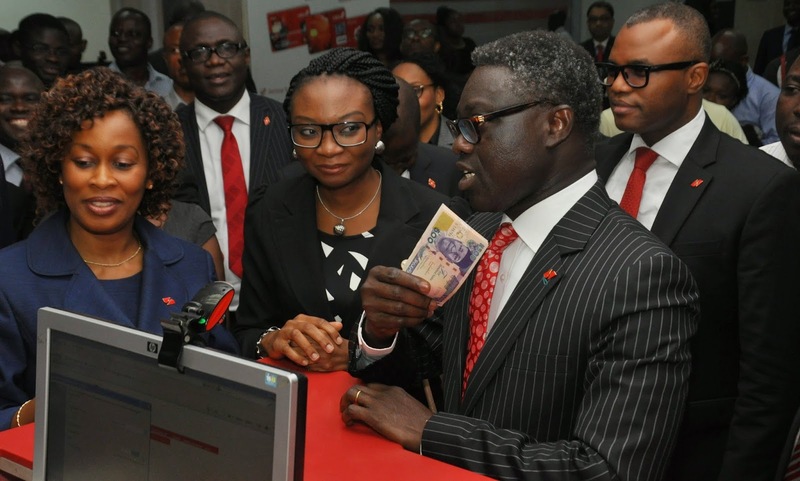 The service will allow Nigerians send money in Naira to over 200 countries around the world by simply walking into any UBA branch in Nigeria or in the 18 other African countries where UBA has operations outside Nigeria or through any other MoneyGram Agent Bank. Speaking during the launch event, UBA’s GMD said the new UBA and MoneyGram outbound money transfer service will boost financial transactions between African countries as many Nigerians who do travel across Africa, no longer have to move around with cash as they can easily transfer money to their loved ones in other African countries or in China, Europe and America to pay for goods and services bought. He described the new money transfer service which has been tagged ‘Naija Sends’ as yet another testimony to the innovative, customer-centric disposition of both UBA and MoneyGram. “This service opens a new vista of opportunity for Nigerians. It offers a great platform to send money to loved ones abroad. As Africa’s global bank, we are proud to partner with MoneyGram to make this service available. It opens a whole new world of opportunities for our customers” Oduoza said. On her part, Regional Manager, Anglohone West Africa, MoneyGram, Mrs. Kemi Okusanya, said the launch of ‘Naija Sends’ has further deepened the brand’s reach and service in Nigeria. “Over the last two decades MoneyGram has facilitated over 15 million transactions in Nigeria, enabling safe, convenient and reliable transfer of funds from the Nigeria Diaspora to their loved ones. As Africa’s largest economy, with over 10 million migrants, we are glad we are now able to also offer Nigerians the opportunity to send money abroad to their loved ones and for business transactions” Mrs. Okusanya said. “MoneyGram with over 300,000 locations in over 200 countries, partnering with UBA with over 700 business offices in 19 African countries and offices in New York, London and Paris, offers the best choice for Nigerian’s sending money abroad to loved ones" she stated. MoneyGram started operation in Nigeria 15 years ago with UBA as its first Agent Bank partner. Today, the MoneyGram network includes 13 Agent Bank partners operating through nearly 5000 locations. United Bank for Africa Plc is one of Africa's leading financial institutions offering banking services to more than 10 million customers across over 700 business offices in 19 African countries. With presence in New York, London and Paris, UBA is connecting people and businesses across Africa through retail, commercial and corporate banking, innovative cross border payments, trade finance and investment banking. I advise you to make your own business, a kind of startup. But if you have poor imagination for it, https://essaydragon.com/blog/creative-essay-writer will help you to improve your creativity in writing.